Swallowing Dysfunction - David J. Hoyt, M.D. The feeling of a lump in the throat, mucus collecting in the back of the throat, or coughing or choking when swallowing, can all be signs of a swallowing disorder. The act of swallowing is a very complicated process in which a number of muscle groups must contract in a very specific sequence in order to propel a bolus of food or liquid appropriately through the throat and into the esophagus. Neuromuscular disorders, strictures, acid reflux disease, and tumors can all interfere with this process. There are a variety of ways to assess swallowing function. Endoscopic evaluation in the office as well as with a speech therapist can be especially helpful. Radiologic swallowing studies can be helpful as well. Sometimes other physicians such as gastroenterologists may be consulted for more complicated problems. Once a diagnosis is made, a variety of treatment options are available. Medical treatment of underlying neuromuscular diseases such as Parkinsonism may prove effective. Aggressive reflux measures can be especially helpful as well. Surgical options including dilation of strictures, and removal of obstructing growths, are sometimes also necessary. 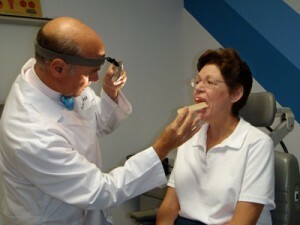 Because of the serious nature of any swallowing dysfunction, it is important to contact your doctor for an evaluation. You may also request an appointment with our offices.